You have a business need for secure and compliant web analytics. Most likely it’s because your organization takes data security and privacy very seriously. Industries such as telecoms, healthcare, banking, and the government and public sector demand premium protection of the sensitive data they gather. And if your organization operates in one of them, then you know that data security must come first. Considering the explosion of data privacy issues and changes across the legal landscape, you need to find a vendor that understands your business and will help you manage data safely and responsibly. One way to do it is by choosing on-premises deployment of your analytics where you keep data under your watchful eyes, safeguarded within the secure parameters of your own servers. Another is by selecting a private cloud, a third-party data center or hosting your instance on secure cloud infrastructure with a certified data center. Until recently, a big player in the field, Webtrends, offered its customers a sure-fire recipe for secure analytics both on-premises and in the cloud. However, self-hosted Webtrends is no longer being supported or developed. For better or for worse, the company took the business decision to focus exclusively on On Demand, a cloud-based solution. But in 2017, its flagship product Infinity™ big data platform was sold to Oracle. The result is that On Demand software also ceased to be updated and supported. With that said, it’s no easy feat to choose a solution that provides you with a complete overview of user interactions, helps you engage customers and keeps you in step with the most stringent privacy regulations. Obviously, you’d need to test the waters before diving into such an investment. In today’s post we’ll assist you in the search for a new on-premises analytics solution or an alternative to the one you may already have. We’ll explain what you can expect from Piwik PRO and Webtrends to make the choice easier. Piwik PRO, established in 2013, provides a platform with analytics, tag and consent management, retargeting and data activation tools. The product marries privacy by design, on-premises, cloud hosting and full data ownership with enterprise-level features and support. Piwik PRO now has over 100 employees on board and is the first Polish company to join the EIT Digital Accelerator. This accomplishment was recognized internationally and paved the way for Piwik PRO to be named to Deloitte’s ranking of the 50 fastest-growing tech companies in Central Europe in 2018. And after a series of thorough audits, Piwik PRO can now boast ISO 27001 certification, internationally the best-known and most-accepted information security standard. Webtrends, a pioneer in the online analytics business, was founded in 1993. With a long history of analytics leadership it now offers a specialized analytics tool for SharePoint, testing software, search and social marketing services. Since the 2017 deal with Oracle, the web analytics solution has been available solely as a legacy product. Your business has unique requirements. You have your own goals, business needs, and resources at hand. To make all that work smoothly requires the right solution. And that calls for research so you know what to expect from a particular analytics vendor. We’ve done the heavy lifting for you – below we present a comparison of the various functionalities and features offered by Webtrends and Piwik PRO. Do you handle your analytics tool on your own or do you have a dedicated specialist? What kind of data are you going to process? Personally identifiable information, sensitive personal data? What kind of support and training do you need? Does your organization require full control of your data? How tightly do you need to control data collection? Now let’s have a look at what you can expect from Piwik PRO Analytics Suite and Webtrends Analytics (A9/A10). We’ll start by looking at flexibility in data collection. Issues like how long it takes to gather, process and deliver data, and then some considerations about data retention limitations. With Webtrends, you can expect to obtain 24/7 real-time data, but only for certain metrics, like: Page views, Visits, Visitors, New visitors, Page views per visit. Furthermore, according to the company’s Standard Data Retention, the Client can review daily/hourly report data as far back as 4 months. You could extend this period, but only for an extra fee. When it comes to Piwik PRO, data freshness varies within a range of 15 minutes to 24 hours. Also, you can store data for an unlimited length of time, with no additional charge. A business may have to retain data for different reasons, whether legal compliance or data recovery capabilities to protect data critical to the business in the event of flood, fire or other catastrophic events. As we’ve already mentioned, a key issue with analytics is where your data is stored. This is particularly important if your organization handles sensitive data. That applies to companies in sectors like healthcare, government, banking or telecoms. For these organizations, data security requirements are even more stringent because of the risk. They are highly regulated, and any privacy breach leads to severe consequences that could blow a hole in their business. Webtrends provides web analytics software on-premises and in the cloud, but only as a legacy product. When Oracle took over the Infinity™ platform it was the end of a significant era. The last update to the self-hosted solution was released in June 2017, while the last update to the On-Demand version was provided in September the same year. Simply put, the product isn’t being developed anymore. And for Webtrends’ customers this means that they won’t get any updates or upgrades, and can’t count on real support. Piwik PRO offers two hosting options. You can deploy it on your own infrastructure and guard it yourself. Alternatively, you can choose deployment in a private cloud, at a third-party data center or on our secure servers located in the US and EU (Germany & Netherlands). What’s more, you can rely on a fully-redundant Microsoft Azure cloud infrastructure with 99% uptime SLA, complete GDPR-compliance and ISO 27001 certified data center. In addition, one of Piwik PRO’s priorities helping you navigate the dynamic regulatory environment surrounding data privacy and security. That is also why the platform is easily configurable to stay compliant with the law. On-Premises (self-hosted) ✔ Legacy solution available. Cloud (On-Demand) ✔ Legacy solution available. With today’s shifting legal landscape, handling data is getting more complex and risky. For organizations where data privacy and security are of paramount importance, there are certain requirements their analytics vendor should help them satisfy. Both Webtrends and Piwik PRO guarantee you’ll retain full ownership of the data you collect. With ownership comes not only responsibility, but also control, access and transparency of data. It means you can access your data at any time, and can be sure that it is accurate and comes from a reliable source. What’s more, you don’t need to worry about losing data, because you’ll have both data redundancy and regular data backups. Webtrends offers data collection centers in Australia, the Netherlands and the United States. But all data is in fact processed and stored in the United States. In the case of some countries like China or Russia, that is a serious roadblock. They completely prohibit the storage of their citizens’ personal data unless it’s kept within their borders. With Piwik PRO you can store your customers’ data on servers located with the EU. This is highly recommended if you collect and process the data of residents of certain European Union countries. Depending on your preferences, you can process and store data in Germany, the Netherlands or the US. In the case of Piwik PRO, large enterprise and public-sector clients continue to demand On-Premises because of its unique 100% data ownership and privacy approach. Whatever deployment infrastructure you choose, you retain complete control and ownership of the data you collect. Also, the Piwik PRO Analytics Suite has been audited and found compliant with stringent international standards by a top global consulting firm. Piwik PRO received ISO 27001 certification, one of the leading information security standards designed to protect company networks by an information security management system (ISMS). Data centers In Germany, the Netherlands or US Data collection centers in Australia, Netherlands, and the US. GDPR compliance using Webtrends requires more effort based on the out-of-the-box features. First of all, it calls for additional setup and involvement from the Webtrends Technical Support team. That applies, for instance, to minimizing the collection of personal data. Also, you can’t delete customers’ data without the assistance of the support team. The information provided on its approach to GDPR is rather hazy and doesn’t even mention data subject requests. Piwik PRO makes GDPR compliance simpler by providing all necessary features in an integrated package. The best example is Consent Manager, which allows you to do more than just collect visitor consents, but also automatically assures that other parts of the platform collect solely data in alignment with those consents. If you use Webtrends, you can build your own consent management software, which is a rather complex and time-consuming endeavor. Or you can turn to a third-party solution, but integrating it with your existing software may lead to some serious fuss and hassle. Piwik PRO gives you a mechanism to manage your visitors’ requests as required by GDPR: data erasure, rectification, access and portability. You can monitor and view an individual visitor’s consent status, then review each request and change its processing status, quickly and easily. Ultimately, if you can’t obtain the consent you need and relying on legitimate interest is also not an option, then you can turn to collecting anonymous data, which is not personal data under GDPR. This means you get accurate web analytics reports without collecting sensitive data. GDPR compliance ✔ Only partially. As we move further with the comparison, there are aspects closely related to data and data processing that need to be analyzed. These include integration and connectivity with other tools, and how freely you can use data. These are all significant elements of your analytics software. In this respect, Piwik PRO and Webtrends have quite a lot in common. To begin with, they provide unsampled data, so you don’t need to worry about compromising the accuracy of your reports no matter how many actions you generate. Then, you can access raw data any time you want through a SQL port. However, both vendors help you take advantage of a reporting API to extract aggregate report data, or apply the API to enrich customer profiles with data recorded during users’ browsing sessions. Finally, you can have connectors to popular BI and data visualization software to improve and speed up your reporting, and to boost understanding of your data for deeper insights and better decision-making. Now, it’s time to dive into features and see what capabilities each vendor offers. This isn’t only about collecting data, but also how you can handle it and what can you achieve with certain functionalities. Using Webtrends gives you the capacity to create custom, ad-hoc reports that speed up your analysis and help you get insights right away. You can also create tailor-made segments to narrow your audiences and improve your targeting and analysis. What’s more, users have at their disposal app analytics with the legacy version of SDK; however, the last update was recorded in 2017. With Piwik PRO, you also get Custom Reports and a back end powered by ClickHouse, a column-oriented database management system that lets you generate reports in real-time and instantly process each query. That accelerates your work and helps you better manage your campaigns. 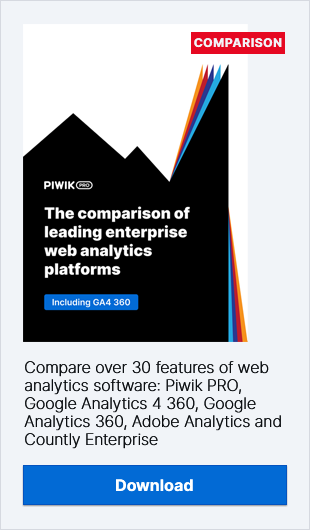 What’s more, Piwik PRO offers all-in-one platform so you can increase your analytics and marketing capabilities with a tag manager, product and app analytics that are available both in the cloud and on-premises. Tag Manager enables fast and efficient deployment, modification and handling tags across the digital landscape without extensive technical expertise. And with the use of templates you can easily deploy and manage custom events, dimensions and variables. Piwik PRO also lets you better understand your visitors at a more granular level using Single Customer View. It gives you the capacity to more precisely target your visitors, spot and fix their pain points across the customer journey. Ultimately, you’ll be able to create more effective and engaging marketing campaigns. With Piwik PRO’s Product Analytics you learn how users navigate your app, which features generate engagement. It also lets you track their digital footprints, take a closer look at their flow, grasp what prompts them to convert, return or churn. You can uncover what value your products bring to customers. With Piwik PRO’s Customer Data Platform you get the ability to connect multiple data sources and stitch together all the data you have scattered across digital landscape. This merged data gives you a 360-degree view of the customer journey’s on-site and off-site touchpoints. Thanks to CDP, you can develop precise customer profiles and make data available to other systems for further use in your marketing strategy. Last but not least, the Piwik PRO suite offers App Analytics, which measures how users navigate your app and see how engaging it is. It lets you find and fix your app’s runtime errors, and generates performance and crash reports. You can take all these findings to optimize the in-app user experience, lifting customer acquisition and retention. (cloud & on-premises) ✔ Legacy version of SDK available. Once you know all the ins and outs of features and functionalities, it’s worth considering how freely you can use the software. Or check beforehand whether your vendor provides any assistance when you run into technical issues. Both Piwik PRO and Webtrends provide you with a certain level of flexibility by offering an unlimited volume of page views and hits per property. On the other hand, in Webtrends you have an overly complex licensing system that results in a limit on the number of pages that can be tracked on a single instance. Furthermore, if you use Webtrends’ legacy product, you’ve got to rely on self-support service. When it comes to small issues that may be enough, but if something serious comes up then your situation is not so rosy. You might need to hire a specialist to do the job. With Piwik PRO you can take full advantage of the on-premises infrastructure without worrying about limitations. There’s no limit on how many URLs and subpages you install on your instance, and you decide about the traffic volume you need. Piwik PRO continually supports and develops its software, and self-hosted solutions require technical assistance, configuration and maintenance. You get a dedicated project coordinator and you will receive all the help and assistance you require for your instance. Our clients also receive a thorough onboarding. In case an incident occurs along the way, the support team is here to handle them. Additionally, you have a range of helpful materials at hand, whether from the Help Center or in a knowledge base. There is a clear distinction between these two vendors and their offerings. The core ones concern the number of tools, variety of functionalities and approach to data privacy along with GDPR compliance. We realize there are many aspects you need to consider, and everything depends on your particular business needs and requirements. The key is finding a vendor that helps you better use your resources, reach your goals and smooth out your organization’s processes. We hope that this comprehensive comparison has cast some more light on important issues and helped you make up your mind about the vendor. And if you decide to switch to Piwik PRO, you can be sure that we’ll be there to help you get it done right. Changing from one vendor to another is often seen as a troublesome exercise. But it doesn’t have to be this way. No matter how small or how big your organization is, we can provide you with support and advice suited to your needs. One of our core services is assistance throughout the transition process to make sure the road is smooth, and your instance is ready to use in the shortest time possible. Once you’ve got Piwik PRO deployed, we offer user and technical training sessions customized to your level of expertise and your organization’s needs. We’ll also stick around to provide 24/7 monitoring and intervention as well as additional support and maintenance services under a bespoke SLA. If you’d like to learn more about how we can help your organization manage the transition process, just drop us a line.